How Do You Get Your Toddler Eating Healthy Food? Like This. Fake Newsflash: Life is really not fair. It’s not fair that my husband can polish off an entire container of Nutella and burn the whole thing off on the couch before halftime hits. It’s not fair that we, as mothers, work so hard to provide healthy and nutritious options at the lunch table, only to see most of that hard work consumed by canines licking the floor. Seriously. We put a LOT of effort into trying to get those Toddler Tornadoes to ingest foods that will properly fuel that growing brain. Why is it that most of the time, then, those healthy efforts are painted all over the dining room like a cheap Jackson Pollock painting? Why do our best efforts often land us in the corner, sniffling away our mom-esteem? Our kids are not robots. DANG IT! There goes 95% of my parenting plans! Out the window! Since declaring an order and watching them mindlessly comply is out of the question *grumble grumble* I guess we’ll have to go to Picky Toddler Eating Plan B. The first thing you should realize as you come to the table, is that our Picky Toddler Eating Plan B will require the cooperation of two parties. You (The Food Provider) and that little person sitting at the table, singing a Sesame Street song and swinging his legs, all adorable-like (The Food Consumer Thrower). This means you have to learn the art of compromise. I’ll grant you, compromise is going to look differently, depending on your toddler’s personality. Speaking of personalities…which one of these sounds more like your little piglet? Personality A: You pick out two outfits, he chooses the one on the left with the train-print pants. Personality B: You pick out two outfits, he insists on wearing socks. Just the socks. If your child is Personality A, you will probably not have any trouble working out a compromise. If your child is Personality B, you will need to Level Up on your Parenting Survival Skills, my friend. You are going to need to use the techniques I’m sharing in this article to sneak in your compromises, because if you attempt to go head-to-head you’re going to end up with a migraine (due to banging your head on the wall in frustration). The trouble with expectations is that they can so easily turn into resentments. For the sake of your long-erm sanity, keep your toddler eating expectations tiny. Your toddler’s tummy is about the size of his clenched, angry, defiant fist. He will need to eat smaller meals, with snacks in between. Be careful of the Snack Monster! Don’t let him snack his way through the day, or you’ll make your dinnertime woes worse. The usual schedule as 3 meals a day with a morning and afternoon snack at relatively the same time every day. The more his tummy is filled with juice and other constant snacks, the less hungry he’ll be at mealtimes, the harder it will be for him to try those nutritious healthy foods! You should also expect those mealtimes to be short and sweet. It’s unreasonable for you to expect him to sit quietly at the table for 45 minutes with nothing to do. If you’d like him to stay at the table when he’s done eating (which won’t be long, since he’s not eating as much), set up a special basket of coloring items or small toys that will let him fidget quietly while other family members finish eating. Here’s some incredibly encouraging good news: Your toddler’s brain is like a spider web. Every time he tries something new or experiences something old in a new way, a brand-new brain connection is made. The more he has those same experiences, the stronger that Knowledge Net gets. The wider his brain web expands, the easier it is for him to enjoy the foods he swore he originally threw on the floor in discuss. Avoid the temptation to introduce ALL the vegetables and fruits at once! He’s got a lifetime to figure out if he likes kiwis. Set a few small vegetable/fruit goals, and give yourself a month to get him used to the taste. I wouldn’t like overcooked mushy broccoli either. Roasted well-seasoned broccoli…well, I could eat that all day. Or what if you pureed it into a broccoli/cheese soup with oyster crackers? This is where a really good toddler recipe book can really come in handy! This booklet on introducing baby food can also be helpful. It provides suggestions on what foods are in season, how to prepare them, and when it’s safe to try certain foods to avoid digestive upsets. Even if your “baby” is closer to being a toddler, it’s a helpful resource (for this child and future ones) and it’s super cheap! There’s a difference between a picky eater and a problem eater. Picky eaters are frustrating, yes, but you know that they will eat. Problem eaters are scary because they may actually refuse to eat completely! Problem eaters are often linked to sensory struggles. If your child only eats a small number of foods (say, 10) and completely refuses to try new ones, that’s a sign of a problem eater. Click here to read a really helpful article on the sensory flags you want to look for. If you do think your child is struggling with Sensory Processing Disorder (SPD), talk with your doctor. A Feeding Therapist can really help! If your family’s dinner has a side of peas, don’t give your toddler a giant bowl of peas! Instead, reinforce the “polite one bite” rule. One pea, followed naturally by a portion of the meal the child already enjoys (like the mashed potatoes, or some pasta). Then, at future meals, gradually increase the portion of the new food, and phase out the follow-up food. For example, if you start his meal with a sliver of apple and then pretzels as the follow-up, eventually you’ll offer more apple, and less pretzels. Remember, your goal isn’t that he loves peas immediately, but that long-term he will come to enjoy them (or at least tolerate their existence at dinner)! This is another great hack when it comes to cutting back on juice. I added a tablespoon of V8 to Lauren’s apple juice, eventually increasing the amount. It was an extremely efficient way to sneak in some extra vegetables without arguments! Here are some unique cookbooks that will give you some fresh ideas on how to create a toddler-friendly healthy lunch. If you feel like family mealtimes are becoming strained while you try to get your toddler eating a new food, try introducing the new food at snack time instead. The consistency is what’s important, and if that happens easier during snack time, instead of meal times, go with that instead. Not only will this help you gauge his preferences, but you can turn to this log in a few weeks, when you’re feeling short on inspiration for healthy foods by recalling that he loved the peanut-butter dip you made for his apple slices! The Lunch Fairy Strikes Again! I’ve found that the more time I have to do something, the better decisions I end up making. If I want my kids to eat something healthy, chances are it won’t happen if I’m trying to whip something up in 15 minutes. As I’ve shared before, the best time for me to prepare the day’s food is in the morning, either while the kids are getting ready for school or (when they were younger) during the first nap of the day. One way to help your child get excited about mealtimes is to make it a surprise! Pack up lunch in an exciting fun lunchbox for them to open, like a present. I would also include a note inside from the Lunch Fairy who explains, in her teeny-tiny handwriting, that she left them a surprise at the bottom fo the lunchbox, but they can’t discover it unless they’ve eaten all the food inside! Once they’ve excitedly cleaned their plate, they can lift up the box (or turn it over and see it taped underneath) a special clue that leads them to a special snack, activity, or tickle game they can look forward to that afternoon. One method commonly used by feeding clinics to help struggling eaters is called the Food Chaining Method. Basically, it means you start with a food your child is already obsessed with, and then gently move towards a different food group using that as a bridge. If your child LOVES chicken nuggets, move from the current brand to one with less breading, to grilled chicken strips, to chicken breasts or thighs. If your child is a huge fan of pizza, let him eat pasta with red sauce and cheese, then tomato soup with grilled cheese, then a cheese quesadilla with salsa. If your child loves crispy foods, move from crispy french fries to crispy sweet potato fries, to chicken sticks, to fish sticks. The important thing is to go slow. Give yourself at least a week or two to make these transitions. You know the saying, “You eat with your eyes first?” Well, putting a side piece of parsley next to your toddler’s mac-and-cheese isn’t going to win him over. Does your child have a friend who’s a more adventurous eater? Pair up for lunch! Have them bring their child’s favorite food (that your child isn’t a huge fan of) and feed the friend a little first. Your child will see his friend happily chowing down and may *fingerscrossed* be more willing to give it a try! You actually do want your toddler to play with his food. Playtime is braintime, remember? Most of your child’s development and growth is going to come from playing. That’s how those important neural connections we talked about earlier get started! Here are some incredibly innovate kitchen plates and tools to inspire his little imagination. Fake Newsflash: Mama does know best! The trick to get your toddler eating healthy food is not to build up your fortress and bombard him with orders and bribes. He will either buck back even harder, or (perhaps worse) he will start to think that he should get a reward anytime you ask him to do something. There’s a time and place for “I’m Mom and You’re Not” authority reminders, but mealtimes shouldn’t be one of them. After all, when it comes to his health, that’s a battle you can’t risk not winning. Instead, set your strong boundaries around a wider maneuvering field. Use these toddler eating strategies to encourage his cooperation, even when he doesn’t realize he’s actually doing what you’d like him to do! And if you keep trying these strategies over several months and still can’t get him to eat, give your doctor a call so he can be evaluated. There’s no use beating your head against the wall if the problem is medical and not behavioral. Give yourself a little credit, friend. He may not prefer the scrambled eggs over the Pop Tarts for breakfast at first…but that’s because his “life experience” hasn’t had a lot of time to learn otherwise! Look through these strategies and decide which ones you’re going to try first, and with which foods. Then give yourself 3 to 6 months of deliberate effort. You’ll be amazed at the progress you can make, when you’re taking tiny steps forward! We ♥ honesty! This post contains affiliate links that provide extra money for our mutual coffee habits addictions. Click here to learn more. Heather is the Chief Encouragement Officer here at MightyMoms.club and has been writing and encouraging parents online since 2007. 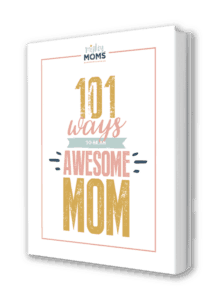 She’s a Certified Gentle Sleep Coach, has been a featured parenting expert writer on blogs like DaveRamsey.com, SimpleKids.net, Cafe Mom, and others. If it’s 2am and you’re desperate to read SOMETHING, check out her deepest darkest secrets, including why she really shouldn’t be allowed to blog.